How can an insect nymph be distinguished from an adult? All arthropods have an exoskeleton. Once it is formed, this hard body covering does not grow. To allow for growth, arthropods have to shed their exoskeleton in a process called molting. Most arthropods have compound eyes composed of many individual lenses. In addition to the compound eyes, many arthropods also have single lens, simple eyes that sense light intensity. All arthropods have an open circulatory system. This type of system has a heart and a few major arteries veins. There are very few capillaries connecting the arteries and veins. The blood spills into the body cavity where it is picked up and taken back to the heart. Arthropods are limited in size because of this inefficient circulatory system. 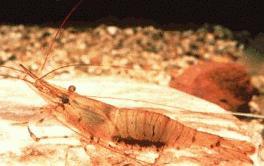 Crustacea - members have mandibles (chewing mouthparts) and branched antennae. Uniramia - members have mandibles and un-branched antennae. Chelicerata - members have chelicerae (pincher-like mouthparts) and no antennae. 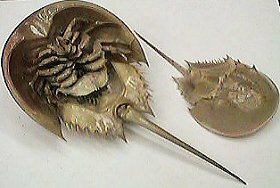 Horseshoe crab - which subphyla do they belong to? 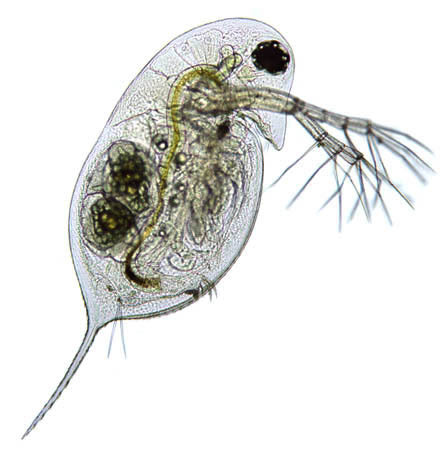 There are some 40,000 species in the subphylum Crustacea, ranging in size from copepods and water fleas that are just large enough to be seen with the unaided eye, to shrimp that you might enjoy as food, to crabs, some with a leg span of over 12 feet. 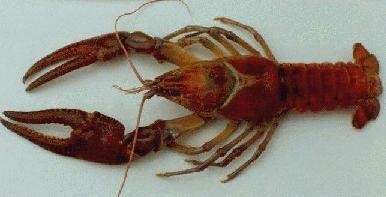 The crayfish is a freshwater crustacean in a group called decapods. 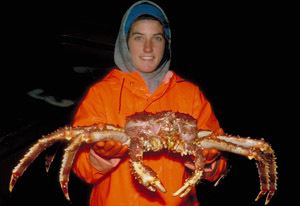 Decapod means "ten feet", indicating that they have five pairs of legs. Cephalothorax - the head (5 segments) and thorax (8 segments). Abdomen - (six segments and Telson). Gills are used for respiration. Feather-like gills, located in a chamber under the carapace, are attached to the base of each walking leg. The green gland is a excretory organ used to remove excess water from the body. There is a system of thousands of small sensory hairs covering the exoskeleton that help the crayfish sense vibrations and chemicals in the water. The two compound eyes, composed of more than 2000 lenses, are set on short, movable stalks. The separate sexes are distinguished by the first pair of swimmerets. The males have a stiff, elongated pair of swimmerets that are used to transfer sperm to the body of the female. All the swimmerets of the female are soft and used to carry the fertilized eggs and newly hatched young. Right click on this (Arthropods) and "save target as" to you desktop. After video has downloaded watch video and complete short quiz at the end. Write your answer here. Why is this phylum named the arthropods? What are the phylum characteristics? Does the arthropod circulatory system differ from that of the Annelida? Explain. Which arthropod subphylum are crayfish classified under? What is the scientific name for a crayfish that is found in Arizona? List the common and scientific name of one member each from the Uniramia and Chelicerata subphyla. Cut and past into word (or draw) a external and internal diagram of a crayfish. Label as many parts as possible (Do not cut and paste a crayfish that is already labeled). Crayfish must be labeled by you. Honors biology: complete the above section along with the following section. Research one specific arthropod (not a crayfish) and list the common and scientific name. Summarize all important characteristic about your arthropod (habitat, reproduction, niche, feeding, movement, body parts, region found, interesting facts, etc). The largest class in the subphylum Chelicerata contains more than 70,000 species including ticks, mites, spiders, and scorpions. Arachnids have a body divided into a cephalothorax and abdomen. The cephalothorax usually bears six pairs of jointed appendages: one pair of chelicerae (fangs), one pair of pedipalps (hold and chew food), and four pairs of walking legs. Scorpions are a familiar site in Arizona. 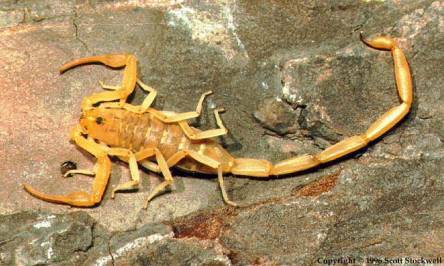 The bark scorpion has a very toxic venom. Ticks carry some serious diseases and should be regarded with caution. 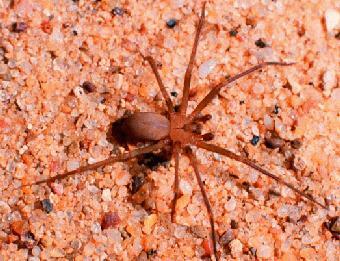 In Northern Arizona, mites called chiggers can cause a lot of discomfort. Most spiders are not aggressive and their bite is no worse than a bee sting. Only two spiders in the U.S. have bites that are normally harmful to humans. Class Diplopoda: millipedes, subphylum Uniramia. Two pairs of weak legs per body segment. Slow-moving with a rounded body. These plant-eating animals do not have a sting. When threatened, they coil up and secrete a noxious fluid containing cyanide. 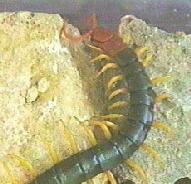 Class Chilopoda: centipedes, subphylum Uniramia. One pair of strong legs per body segment. Fast-moving with a flattened body. These carnivorous animals have a pair of poison jaws, not a stinger. Class Insecta: insects, subphylum Uniramia. Head - with one pair of un-branched antennae and the mouth parts. Thorax - with three pairs of jointed legs (6 total) and, in many species, one or two pairs of wings. Abdomen - has neither legs nor wings. Keys to the Orders of insects. Most insects go through complete metamorphosis, which enhances their chance of survival. Since the larval and adult stages usually live in different habitats and eat different foods, they do not compete for space and food. Most butterflies and moths spend the winter in the pupa stage, often buried in the ground. Larva - Looks nothing like the adult. Pupa - A stage in which the larva changes into the adult form. 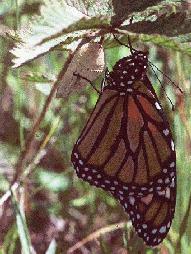 The pupa of butterflies is enclosed in a protective case called a chrysalis. The pupa of moths is enclosed in a protective case called a cocoon. 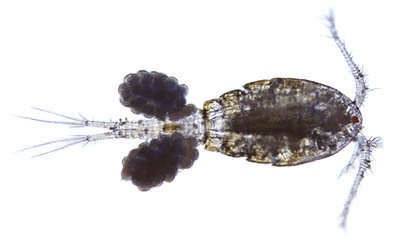 Nymph - The nymph looks similar to the adult but does not have wings or sexual parts. Insects have a wide range of defensive adaptations that increase their chances for survival. These range from passive, like camouflage, to aggressive, such as the venomous stingers of bees and wasps. Insects that defend themselves by being dangerous or poisonous often have bold, bright color patterns that make them clearly recognizable and warn predators away. This type of coloration is known as warning coloration. Several dangerous species have similar patterns of warning coloration, such as the black and white stripe pattern found on many wasps and bees. This adaptation, in which a member of one dangerous species mimics the warning coloration of another, is called Mullerian mimicry. Some harmless species also mimic the warning coloration of a dangerous species. This type of mimicry is known as Batesian mimicry. The grasshopper is generally used as a "typical" insect for anatomy study. Head lice are also insects. Test your knowledge of insects and spiders. Paste this grasshopper diagram onto a Word document, enlarge and label the following parts. Below the diagram give a brief definition of each part. Find a diagram of the mouth parts of a grasshopper and label the: labium, labrum, maxilla, clypens, palps and mandibles. How do chiggers cause discomfort to humans? Briefly describe what will happen if a human is stung by a black widow. Briefly describe what will happen if a human is stung by Centruroides exilicauda or sculpturatus. Click on this scorpions link . Read the information and test your comprehension by taking the quiz linked at the bottom. How did you do? Cut and past your results here. 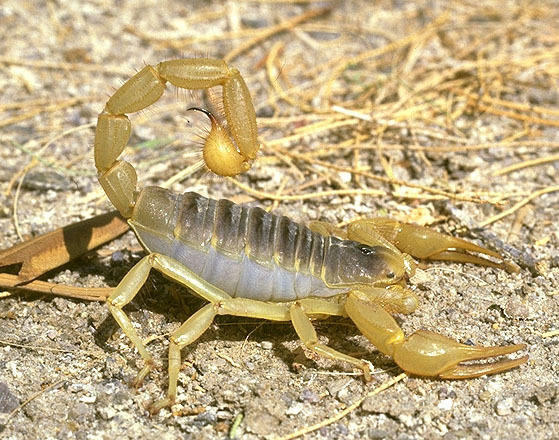 There are 25 - 30 different species of scorpions in Arizona. Examine these photos (A) (B) (C) of the most venomous, the most common and least common scorpions found in Arizona. Using the pictures find the common and scientific names of each (finding a identification key will be helpful). 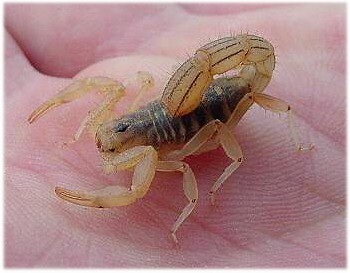 In Arizona we often find scorpions in and around homes. Can you identify a Bark scorpion? Use this link to find and list all the characteristics use to identify this type of scorpion. Compare and contrast complete and incomplete metamorphosis, is there a benefit to either? What type of defenses have insects developed? Explain. Briefly describe what head lice is and how you can get it and get rid of it. Name the Arizona state insect. What arthropod class does it belong to? What can a forensic entomologist find out about a homicide? Explain how this is done? Using the forensic entomologist (science career) link above read case no. 1 and answer the following questions. What evidence was used to solve the crime? Who was eventually charged with the crime based on this evidence? Crayfish dissection - South Plains College biology dept. An insect nymph looks like the adult, except it does not have wings or sexual structures.